We’ll be eating smoked ham in our house for Easter. Ham is easy to smoke, and there are some great flavors you can add during the smoke process to make your cook really stand out. 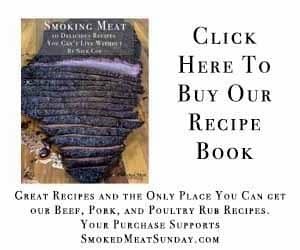 If you’re looking for a smoked ham recipe and a ham glaze recipe, keep reading! What Kind of Ham Should I Choose? There are a few different options you can choose from when you’re picking out your ham for Easter. 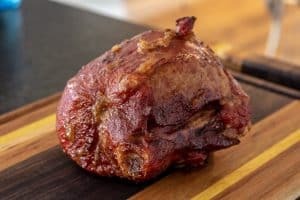 The rule of thumb is to cook about 1/3 to 1/2 pound of ham per person if you’re smoking a bone-in ham, and about 1/4 to 1/3 pound of ham per person if you’re smoking a boneless ham. 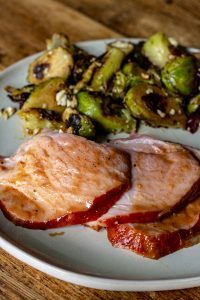 For this recipe, I used a Snake River Farms Kurobota mini bone-in ham. At 3.5 pounds, it’s the perfect size for our family of three, with plenty of leftovers. This ham was not spiral cut, and that was my preference. I prefer thicker slices, and I feel that it’s easier to keep the ham from drying out if I can carve it after it’s cooked. 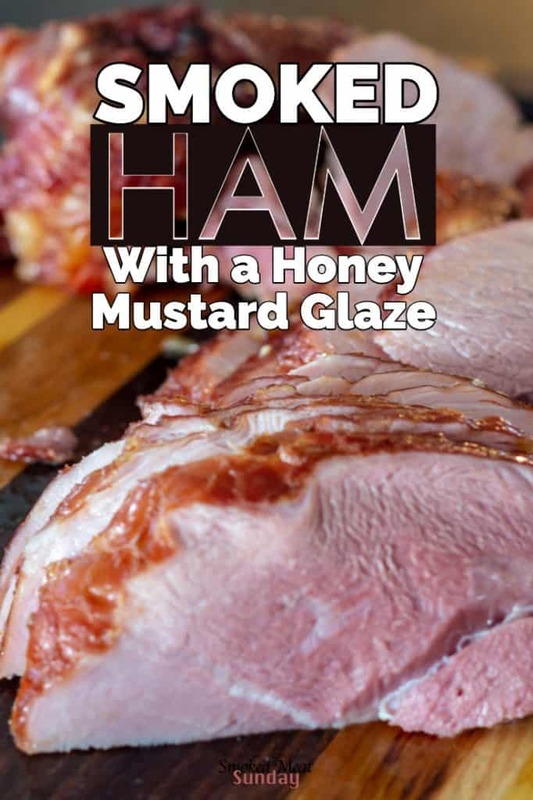 You can add some great flavor to the ham with a good glaze, and my honey mustard glaze is definitely the star of this smoked ham recipe. We use the glaze to add some great flavor to the outside of the ham, and as it slow smokes, some of that glaze will penetrate the meat too. Use a rubber basting brush and baste the ham every hour. 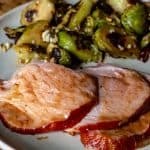 This honey mustard ham glaze recipe uses apple juice, Worcestershire, garlic, onion, honey, mustard, and a few tablespoons of my sweet bbq rub. It’s a thin glaze, and that’s a big key in adding flavor to your ham. 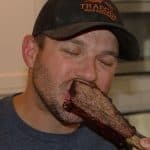 If the glaze gets to thick, it won’t penetrate the meat as well (but it will still taste delicious). 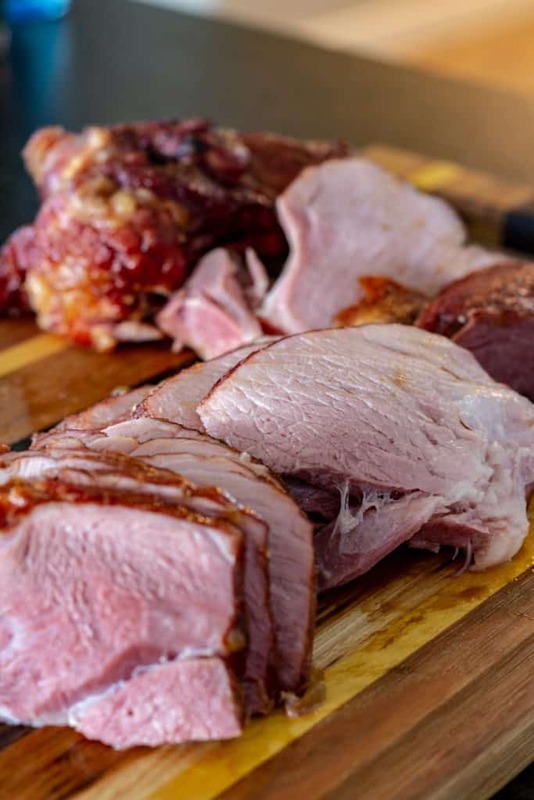 There are a couple of different opinions on this… Most hams that you purchase at the store are already smoked, all you have to do is get them up to a temperature of 140 degrees and they’re ready to serve. This Kurobota Bone-In Ham was soooo delicious. 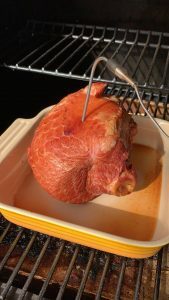 You can add some additional smoke flavor to the ham by smoking it at 225 degrees, but by doing this, you can also run the risk of drying the ham out. If you went with a spiral cut ham, soak it in water for about 30 minutes before you put it on the smoker. When the ham gets up to an internal temp of 115, turn up the temp of your smoker to 350. Continue to let the ham cook until the internal temp hits 140. Personally, I don’t double smoke my hams. I don’t see a noticeable difference in flavor, and the time savings is worth it for me. All I do, is cook the ham at 350 degrees until the internal temp hits 140 degrees. The glaze adds plenty of flavor to the ham, and cooking at 350 instead of 140 reduces your cook time significantly. It took 90 minutes for us to cook our 3.5-pound Kurobota Ham. Make sure you save the bone to use in soup later on! Your ham dinner doesn’t have to be complicated. 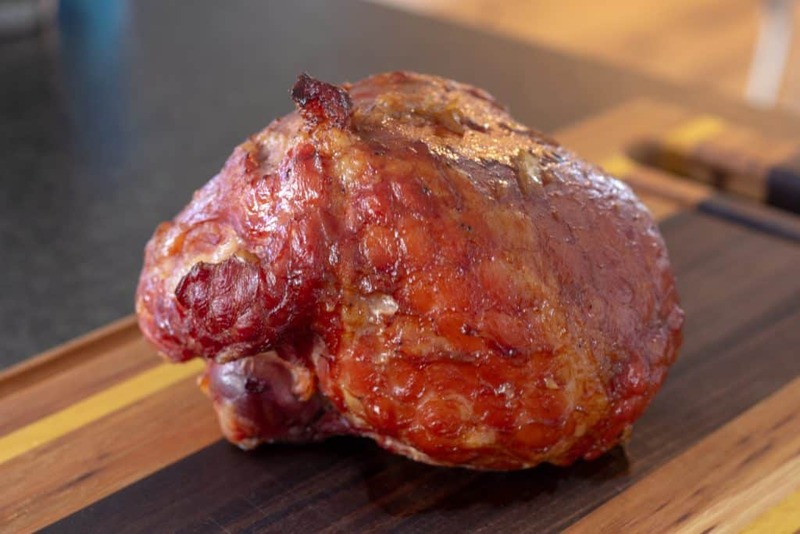 This smoked ham recipe uses a mini kurobota ham from Snake River Farms. We add a simple glaze to the ham during the cook to add some great flavor. Our five year old LOVED this recipe, she was begging for second and thirds! Set up your smoker to cook at 350 degrees. When the smoker gets up to temp, place your ham in a roasting pan, and put it in the smoker. If you have a Smoke temperature probe, insert the probe at this time as well. Add the olive oil, garlic, and onion to a medium saucepan over medium heat. When the onion is translucent, add the apple juice. Continue to simmer the apple juice until the liquid has reduced to half. Add the remaining ingredients, and stir. Bring the saucepan outside with your basting brush, and apply your first layer of glaze. Be generous here… the ham will soak up most of that flavor. When the internal temperature of the ham hits 100, glaze the ham again. Repeat the process at 110, 120, and 130 degrees. When the internal temp of the ham hits 140 degrees, it’s done. Remove from the smoker, and carve. Serve with any of the remaining glaze.